Quietly, without anyone knowing, Tel Aviv University avoided last weekend a first of a kind academic boycott. As always, those who stood up to defend the Israeli academia against the pro-Palestinian boycott of Israel was not the university itself, nor the Ministry of Education or other governmental offices, but rather the people on the ground - the students. The biggest sin of Joy Harjo was that she has written on her Facebook page she's on her way to visit Tel Aviv. Harjo, a Native American poet and musician, was invited to perform for students of the Department of American Studies at TAU, and provide a glimpse into the rich, indigenous culture of the American continent. But the anti-Israel activists had other plans for her: Within a few hours after her announcement, Harjo's Facebook and Twitter accounts were filled with dozens of threats and hate talkbacks. Those who posted the comments, mostly anti-Israel activists from around the world who have never heard of Joy Harjo, accused this gentle 60-year-old woman of abuse of human rights and active participation in genocide and ethnic cleansing of Palestinians. Harjo was also accused of collaborating with the "apartheid university" of Tel Aviv, "because the entire city is built on occupied Palestinian territory." Others have gone even further: Harjo received dozens of phone calls and messages from people who offered her money just to cancel her show and not "entertain apartheid." Among them was also a representative of "Coalition of Women for Peace" (CWP), an Israeli NGO that defines itself as a feminist organization that is "bringing together women from a wide variety of identities and groups" and an initiator of "public campaigns, education and outreach programs." Among the organization's members there are also Israeli professors. 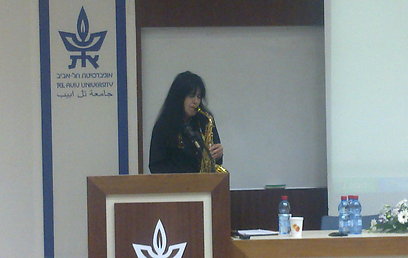 CWP's member, Dr. Dalit Baum, a former lecturer at Haifa University and today a US resident, presented herself as a an "Israeli teacher" and begged Harjo to boycott TAU and its students, again, because of the so called "apartheid." Yes, the same TAU which allowed its Arab students only a few months ago to host a 'Nakba' memorial ceremony is now accused of being an apartheid institution. Dr. Baum is not alone. She joins a long list of Israeli academics who hold anti-Zionist views who make their living from targeting and punishing us just because we are Israelis. In response, we, dozens of TAU students from across the Israeli political spectrum, have personally wrote a letter of support to Joy Harjo. Those activists call themselves "liberal and feminist," but at the same time they choose to intimidate an elder spiritual woman and Native American human rights activist into boycotting knowledge, freedom of thought, ideas and people - all the things which form the foundation of the academic institution we are so proud to be educated in. Could you think of another place in the world where students are required to defend the name of their academic institution from academics they've met just a moment ago in class? Well, welcome to the Israeli academia theater of the absurd. Needless to say, the aggressiveness of the campaign against Joy Harjo is very similar to other boycott campaigns against artists and intellectuals invited to Israel. The funny thing is that it actually had a positive impact on Harjo. She decided not to surrender to narrow political interests and participate in three different events organized by the university. She met up with students and provided a fascinating, rare glimpse into her amazing spiritual world. Joy Harjo's case revealed once again the true face of the well-orchestrated boycott campaign being waged in recent years around the world against Israel - often with the help of Israelis - to pull the rug out from under Israel's legitimacy, its institutions and its society. This is a campaign that relies primarily on intimidation of many people overseas who are not proficient in the complexity of the Israeli-Palestinian conflict, using half-truths and whole lies that are constantly presented as facts. It is also difficult not to notice the paradox, in which Israeli academics, with the backup of self-proclaimed "peace NGO's," promote the boycott of academic institutions while they still educate generations of Israeli students and scholars, the future of the Jewish state. I cannot help but wonder how those hypocritical lecturers and academics manage to sleep at night, while mine and my fellow students' tuition is funding their excessive salaries as they're invited to speak for the sake of the boycott at panels and events around the world, in order to harm with their vicious activity the institutions of the "notorious Zionist entity"- the same one that does not forget to pay them every month. Upon entering the education system, every Israeli child learns to recite the saying "Do not cut the branch on which you sit." It seems that the academic Ivory Tower should go back to basics and learn from the first graders about ethics and social solidarity. For us Israeli students, activism and the demand for social justice does not end in setting up tents and demonstrating at the city's main streets; it also presents an uncompromising and firm stand against those seeking to defame the Israeli collective - a complex mosaic of identities, genders, backgrounds and opinions. We must all unite against the boycott, only because it is blind and does not distinguish between Likud or Labor, Meretz or National Union voters. In this battle for hearts and minds there is only one winner - the spirit that lies within us, the Israeli spirit. We have not forgotten it. Just like us, it is here to stay. See all talkbacks "How do they sleep at night?"